Property Location Located in Nevada, Holiday Inn Express & Suites Nevada is in a rural location and close to Fox Playhouse and Bushwhacker Museum. This hotel is within close proximity of Nevada Country Club and Radio Springs Park.Rooms Make yourself at home in one of the 68 air-conditioned rooms featuring refrigerators and microwaves. Complimentary wireless Internet access keeps you connected, and satellite programming is available for your entertainment. Private bathrooms with bathtubs feature bidets and hair dryers. Conveniences include desks and coffee/tea makers, and housekeeping is provided daily.Rec, Spa, Premium Amenities Take advantage of recreation opportunities including an indoor pool and a fitness center. 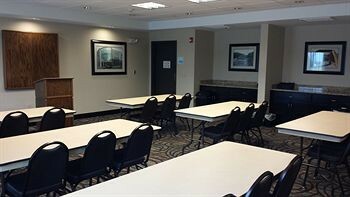 Additional features include complimentary wireless Internet access and shopping on site.Dining A complimentary hot/cold buffet breakfast is served daily.Business, Other Amenities Featured amenities include a business center, a computer station, and laundry facilities. Planning an event in Nevada? This hotel has facilities measuring 583 square feet (52 square meters), including a meeting room.